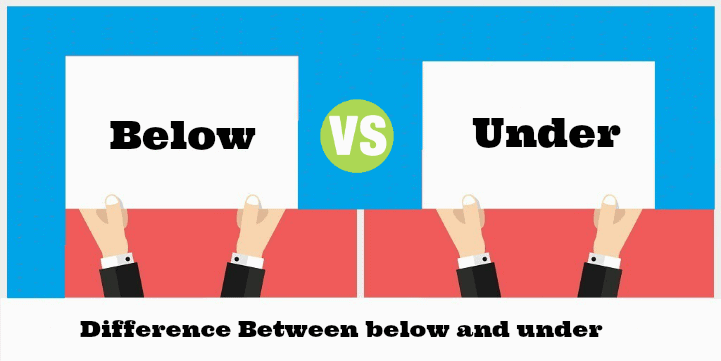 Summary: Difference Between Below and Under is that Below is a preposition and an adverb. While Under is a preposition. Under can also be used as an adverb. Below is a preposition and an adverb. Below is also referred to someone underage. From Eiffel tower the people below looked like minions. This stony path runs below mountain. Answer all these questions below only in two lines. KSE shares have fallen below 40-index. The City of Skardu is located below the mountain ranges of Karakoram and Western Himalayas. Adam’s such petty attitude is below morality. The number of storey’s in the building below is less than fifty. The temperature in Arctic Ocean always drops below freezing point. The drowning boy was stuck in a cave at the bottom of the river below. Candidates below 40 years are not eligible for the post of CEO. From Middle English bilooghe, from Middle English bi “by” + looghe “low. Under is a preposition. Under can also be used as an adverb. I am standing under the roof. His body is buried under several feet of sand. The capacity of this jug is under 1 liter. Under this contract company should have to fulfill the needs of employees. Many animal species are under threat of extinction. Doctor put the man under for physical examination. Rhizopus is listed under kingdom fungi. Under dictatorship of general the country’s economy destroyed. Under agreement, you are bound to work for 10 hours daily. There is a similar difference between above and over. Above is used in measurements of temperature and height. Over is used to express ideas such as ‘older than’ and ‘more than’. Under is used to refer lower position, to show that something is covered, to show capacity, for obligation, to show things are being affected, for subjection, for classification, for authority, for agreement. From Old English under, from gem-pro *under (whence also German unter, Dutch onder, Danish under), from a merger of ine-pro *n̥dʰér and *n̥tér. Below is used to express something/someone in a lower position, to mention something later (in writing), used to express something less in amount /rate/level, to show a lower place, to someone unworthy, expresses something lower in size/ number, to describe lower temperature, to describe something at the bottom/underneath, to someone underage.